Nutsedge is one of the more prolific and persistent weeds we have here in North Texas. Nutsedge thrives in compacted, poorly draining soils or beds that are overwatered or have irrigation leaks. If you've had an increasing problem with nutsedge then your soil is probably too compacted and may be staying too wet. 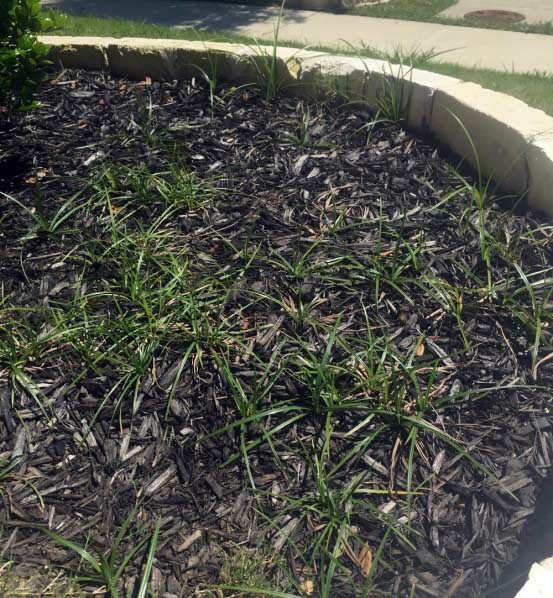 With all the heavy spring rain we've had this year, you're bound to see nutsedge popping up in your landscape. While not really a grass, but rather a sedge, these plants have thick tubers, often called “nuts”, that can survive a foot and a half deep in the soil. These tubers quickly produce new plants. Because of these tubers, nutsedge can be very difficult to eradicate from your lawn and landscape. Non-selective Chemical herbicides like Roundup are not effective in killing the plants; while chemical pre-emergents also have no effect. Roundup might do some damage to the green tops of the plant but it won't affect the tubers. There are selective herbicides such as Sedgehammer, but even it does not kill the tubers of mature plants. The best control for nutsedge? Prevention. Well aerated and fed soil will harbor less nutsedge. If you already have nutsedge, then physically removing the tubers is the next best control practice. Remove plants roots and all, 8-14 inches deep in the soil. If you can limit the production of new tubers you can eventually reduce the nutsedge population. Nutsege starts to develop new tubers when plants have about 5 leaves (which is RIGHT NOW). Regularly pulling the plants out of the ground before they have 5 leaves will suppress the nutsedge population over time.